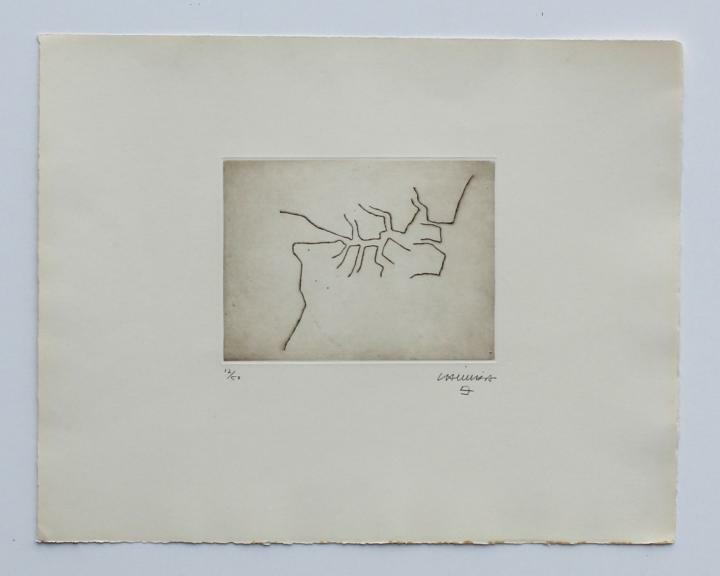 Etching, a fine, fresh impression of the only known state, the full sheet, printed on cream white BFK Rives, with margins, hand-signed, numbered and with the artist's cypher in pencil, executed in an edition of 50 (there were also about 14 proofs), printed by Atelier Maeght, Levallois, published by Maeght Editeur, Paris, in fine condition, unframed. Koelen, Martin van der. Eduardo Chillida: Catalogue Raisonné of the Original Prints, Opus P.1., 1959-1972. 1999, Munich, Chorus-Verlag für Kunst und Wissenschaft Mainz, pp.52-53, illustrated (another example).